Place the chocolate and olive oil in a blender. Whisk the Half & Half egg yolks, granulated sugar and salt in a heavy-bottomed medium saucepan over medium heat. Sir the mixture constantly, making sure to scrape the bottom and edge of the pot with a heatproof spoon or spatula so that the mixture does not burn. Continue to stir until the the custard is coats the spoon and almost begins to simmer, about 5 minutes.Immediately pour the custard over the olive oil and chocolate in the blender. Cover and hold the lid with a thick kitchen towel; blend until combined and smooth, stopping to scrape down the sides of the blender as needed. 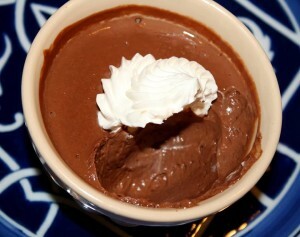 Divide the chocolate mixture among 6 ramekins or cups and refrigerate for at least 3 hours. In a large, heavy bottom pot heat the olive oil over medium-high heat. Add the pork and brown well, breaking the meat up in to the smallest pieces possible, for about 5 minutes. Remove the meat to a bowl and reserve. To the same pot add the mushrooms and saute until caramelized, about 5 minutes, scraping up any bits of browned meat, and stirring occasionally.Add the shallots, carrot, and celery and saute for another two minutes. Add the garlic and saute for another minute. Deglaze the pan with the red wine and reduce by half. Add the tomatoes and thyme and reduce the heat to low and cover. Cook at barely a simmer, covered, over low heat for 1 hour, stirring occasionally. Add a a few tablespoons of stock or water to the sauce if it loses too much moisture.Taste the sauce and adjust the seasoning with sea salt and freshly ground pepper. 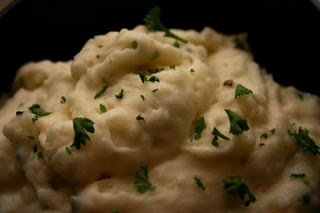 Have you been searching for an easy, tasty, inexpensive, nutritious, one dish, meatless meal? Well search no more. The traditional Spanish tortilla is an egg and potato dish that fits this criteria. It can be eaten hot but is just as delicious enjoyed at room temperature which makes it an ideal meal on a warm summer night. I’ve paired the tortilla with a garlic aioli made from fruity Ultra Picual Extra Virgin Olive Oil. The Tortilla provides a nourishing comfort food, rich with egg and hearty potato. The aioli condiment provides a counterbalance to the rich caramelized flavors of the tortilla with zesty lemon, piquant garlic and fruity extra virgin olive oil. Add a simple salad and you have a well balanced, delicious meal. Heat 4 tablespoons of olive oil over medium-high heat in a 12″ cast iron skillet. Add the sliced onions and saute until light brown in color add the thyme and saute for another minute. With a slotted spoon remove the onions and thyme and mix them in to the beaten eggs. Season the egg-onion mixture with sea salt and pepper. Heat the oven to 375. With the oil remaining in the skillet, lightly season the potato slices with a sprinkle of sea salt and pepper and layer the slices in concentric circles at the bottom of the skillet. Continue layering until all potatoes are used. Brown the bottom layer of potatoes over medium heat-high for 2 minutes being careful not to burn the potatoes. Pour in the egg-onion mixture over the potatoes and cover the skillet with a lid. Place the covered skillet in to the preheated oven for 10-15 minutes until the egg layer on top is golden brown and the potatoes are tender. Invert the tortilla on to a platter and serve warm or allow to cool to room temperature. Serve with aioli. Grease an 8″ x 8″ square baking pan. Combine sugar, lime zest, Delizia Persian Lime Extra Virgin Olive Oil, lime juice, butter and sour cream in a 2 quart saucepan over medium heat for 5 minutes or until sugar is dissolved and mixture boils, stirring constantly. Continue boiling over medium heat or until a candy thermometer reaches 238 degrees. Remove from heat, stir marshmallows and white chocolate until melted and mixture is smooth. Immediately pour fudge into greased pan and let stand about 10 minutes until top is firm to touch. 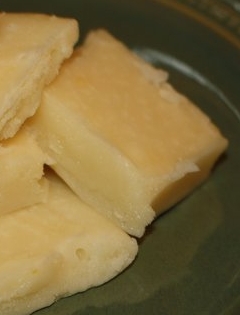 Using a knife, score top of fudge to make fudge squares. Refrigerate about 1 hour. 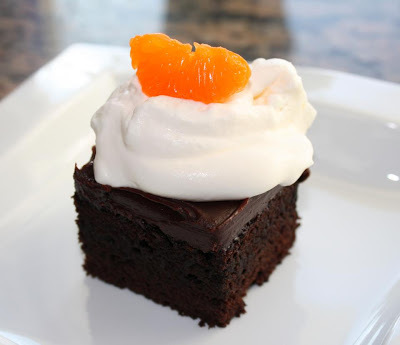 When cool and firm, cut out fudge. Preheat the oven to 350 and adjust the rack to the middle of the oven. Using agrumato lemon olive oil, grease and flour one 9″ cake pan. 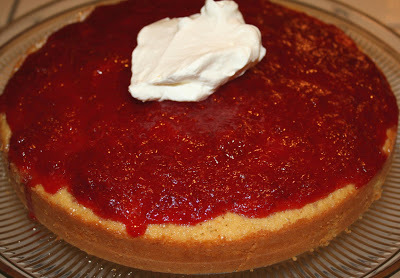 Lightly grease two 9-inch cake pans, one muffin pan, or one 13×9-inch pan with Blood Orange Agrumato. Mix together all the dry ingredients in a large bowl. Thoroughly mix together the liquid ingredients in a separate large bowl until smooth. Add the dry ingredients in to the wet and mix using a hand or stand mixer on low. Pour the mixture into the prepared pans.Bake for 30 minutes (cupcakes will take about 15 min.) or until a cake skewer inserted in the center of the cake comes out clean. Make sure to not over-bake the cake. It should spring back when lightly touched, and a cake skewer inserted in the middle of the cake should come out clean.Cool for 20-25 minutes before removing the cakes from the pans to cool completely. Apply ganache when cool. 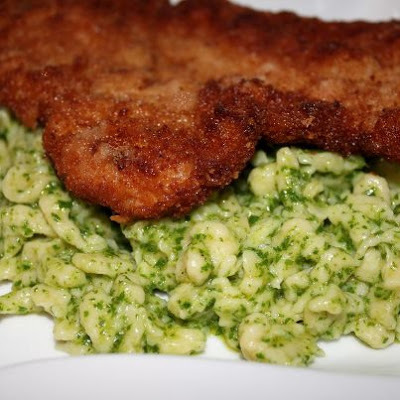 Baby Arugula-Lemon Pesto….And Some Schnitzel Too! Here we have a pork chop, also known as schnitzel in German cuisine, pounded to 1/4-inch thick, breaded, and then pan fried in UP Extra Virgin Olive Oil until golden brown and delightfully crisp.Anywhere oil is used, Ultra Premium Quality Extra Virgin Olive oil can and should be used…. even in classic and updated German recipes. Heat 2 inches of extra virgin olive oil in a heavy frying pan, (a seasoned cast iron pan is ideal) until the oil reaches 350. Gently add the pork chops to the heated olive oil, being careful not to overcrowd the pan, and fry for approximately 3 minutes per side, until golden brown. Remove each pork chop to a wire rack while frying the remaining pork chops. Combine all the ingredients in the bowl of a food processor, or in a blender, and process until smooth. 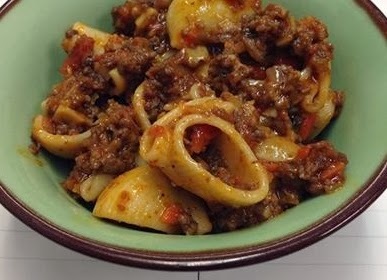 Serve over pasta, with bread, on pizza, bruschetta, with grilled or roasted vegetables, in lasagna, with fish, over beans, in a shoe (j.k.)… etc. Add the batter to a spaetzle maker or add to a large colander. If using a colander with larger holes, push the batter through the colander using a spatula in to the boiling water. Boil for about two minutes, and then remove to a bowl and toss with pesto immediately, or a tablespoon of extra virgin olive oil. Fresh quince can be elusive. But this is definitely the season in which to find them. In light of the fact that they’re not edible, or at least enjoyable in their raw state, they have not found popularity in the market like other fall/winter fruits.That being said, I am smitten with this chameleon of the fruit world. When its bumpy-ugly mug is cut open, fragrant creamy-white flesh is exposed. 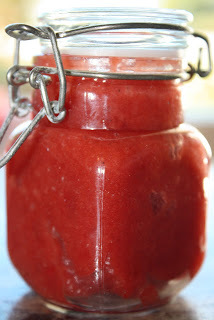 Then magically its flesh turns the most festive cranberry-red color when cooked for a few hours. The aroma of quince is jaw dropping, boasting notes of apple, flowers, and tropical fruit. It is at once intoxicating and comforting. While it simply begs to be eaten out of hand, don’t be lured by its siren song! Instead, follow my recipe below and you will be rewarded with a rare, otherworldly condiment perfect for pairing with cheeses, roasted meats such as pork, chicken, or turkey, or slathering on buttered, toasted crumpets. 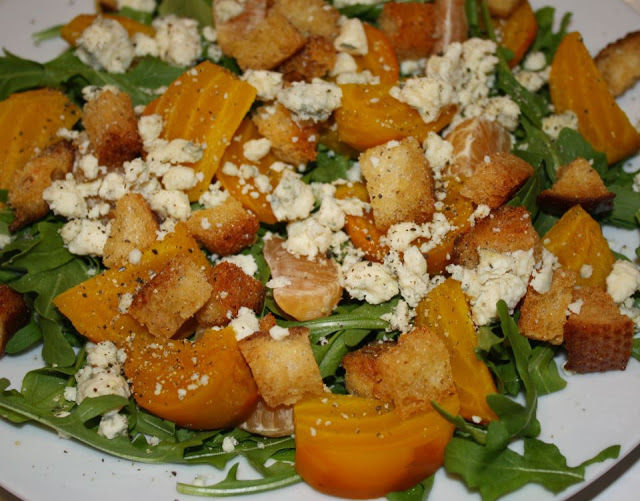 The sweet earthiness of the golden beets, along with the salty blue cheese, nutty arugula, tangy tangerines, and pungent olio nuovo olive oil make this salad a virtual party in your mouth. Beyond that, the impeccably fresh seasonal ingredients are visually arresting, and resemble a ray of golden sunshine on the plate.